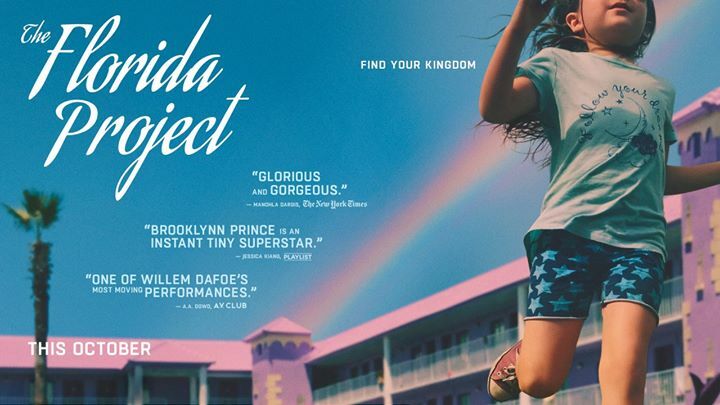 The Florida Project owes some debt to Beasts of the Southern Wild, another audacious and free-flowing picture that relied almost exclusively on a natural environment and its inhabitants through the eyes of a child. In that film, the environment was the Southern bayou and a community cut off from the rest of the world by a Louisiana levee. Here, it is a stretch of highway miles from Orlando’s Disney World, where gift shops, liquor stores, time share scams and gaudy, low-end motels litter the strip. The motels are primarily housed by people who pay by the week (the unfortunate tourists did not look too closely at the promotional materials), and we are introduced to the milieu via the daily play of four young actors. They are the children of poor people who cannot care for them during the day, and they play largely unobserved, unhindered, wildly, and desperate for attention. That attention is given to them in a decent and caring manner by the motel manager, Willem Dafoe, who struggles to keep the right amount of emotional distance from the residents, almost all of whom are troubled or are going through tough times. He can barely disguise his affection for the children while at the same time maintaining order at his establishment, an order which includes forcing residents to spend a night away from the place at intermittent periods so they do not establish residency, and presumably, tenant rights. I understand the child actors were for the most part amateurs, and the decision to use them was keen. The best child actors lack the affectation and self knowledge you often find at its worst on Nickelodeon or in precocious children who watch too much of it. These children are so natural, the film nearly veers into documentary, making their plight all the more harrowing and their story all the more compelling. Brooklyn Prince, the leader of the kids, is seven years old, and she is mesmerizing. Dafoe, who is nominated for best supporting actor, delivers a dignified, quiet and measured performance, but the film is stolen by Bria Vinatae, who plays the single mother of one of the children. She is a child herself, wholly ill-equipped to raise one of her own, yet fiercely loving and resourceful. Director Sean Baker (Tangerine) eschews a traditional narrative, opting for a languorous approach that mirrors the hot summer days depicted in the film. The effect is to embed the viewer with the children and their community, which heightens what you feel for these kids. Yet, there is not a single maudlin or false note.